This self-taught guitarist performs a wide range of musical styles including classical, Latin & jazz guitar but has found flamenco to be his true calling. With 17 years professional experience this artist started playing at a young age. 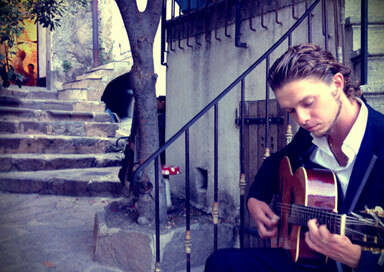 This self-taught guitarist has experience with a wide range of musical styles but has found flamenco to be his true calling. Having lived and worked with dancers and singers in Seville, Cadiz and Granada in the local flamenco scenes he has gained a lot of first hand experience and feel from the birthplace of Flamenco, Andalusia. Over the years he has learnt to incorporate and fuse musical techniques and perspectives with the flamenco tradition and now composes his own original flamenco music that, although rooted in tradition, manages to do so by reflecting his experience with jazz, latin and Brazilian music. This makes him rather unique among flamenco guitarists as he is able show flamenco to be a dynamic and forward thinking music and thus able to keep up with the changing state of the music as it undergoes reform in Spain. Apart from flamenco, he also plays a range of classical pieces, which are popular for private functions, and also plays Gypsy jazz, another guitar style which was popularised by Django Reinhardt and Stephane Grapelli in the 1920’s and 30’s in Paris. With this flexible approach, he is in an ideal position to respond to the needs of his clients and is open to suggestions so that his repertoire can be adapted for your event; allowing him to change the tempo and feel of the atmosphere his music creates so as to better cater for the tempo and feel of the event in question; one minute playing something relaxed and tranquil the next able to change gear and add some music that his clients can tap their feet to.